Chloe Flora Blanchard was the mother of John Clark Thornton, grandmother of Paul Rowell Thornton. Chloe was born in 1819 in Greensboro, Vermont to James and Phebe (Carter) Blanchard. Her father was from Canterbury, New Hampshire and her mother's origins are difficult to trace. There were Carters in New Hampshire and in Vermont at the time. She may have been born in Greensboro, Vermont. 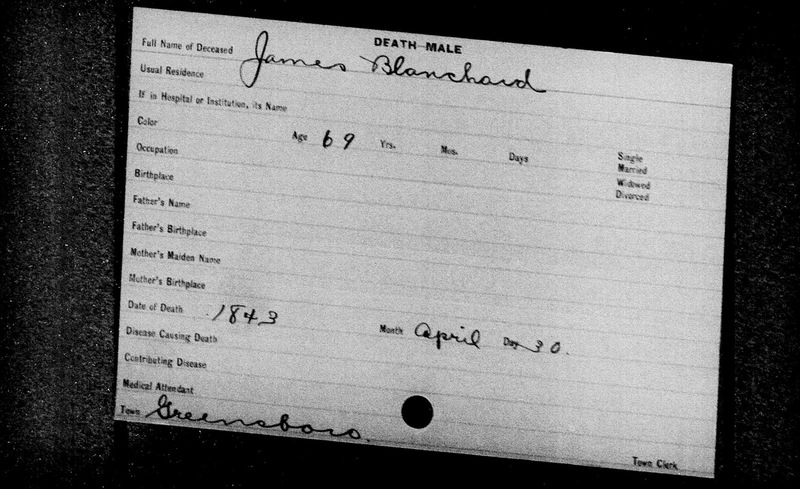 James Blanchard's father, uncles and some cousins went to Vermont after the American Revolution. Chloe seems to have been the youngest of at least 9 children. Her father joined the Congregational Church in 1810 and several of his children were baptized later that year. Her mother was baptized in 1817. Three of Chloe's siblings: Ruth, Royal Carter and James Chadwick left Vermont to become Shakers, they lived in the Shaker Colony in Canterbury, New Hampshire. James Blanchard, her father, moved to Wheelock by the time of the 1840 census. Two of his neighbors are Samuel Thornton, on one side, and David Thornton on the other. Chloe's mother died in 1840 and her father died in 1843, they are buried in the cemetery in Greensboro, Vermont. Chloe married Samuel Thornton in Wheelock, Vermont in 1841. In the 1850 census, Chloe and her husband and six children are living in Greensboro. Samuel was a farmer, they may have inherited her father's farm after his death in 1843. One of her children, Alva,age one in the 1850 census, is not listed in the 1860 census, presumably he has died. Also by 1860 her two oldest children, Lucinda and Phebe, have left the family home. I cannot find them in the 1860 census, but both are married by 1870. The rest of her children, William, Jabez, Nathan, Maria, Joseph, Benjamin and John. By the 1870 census the family has moved to Hardwick, Vermont. In a land deed which refers to the Old Samuel Thornton farm, the farm is described as a sugar maple farm. Living with them are Maria, Nathan, Joseph, Jabez and John. Samuel Thornton died in 1874 age 58 and Chloe in 1876 age 57. Most of their children lived and died in Vermont. William went to Troy, New York, he was a laborer in a cemetery. Nathan died young of TB, Maria died and her husband married the widow of her brother Joseph. John Clark Thornton married twice, his first wife, Nettie Hazen died after only a year of marriage. He left Vermont for Boston, Massachusetts. He ran a successful milk delivery business.